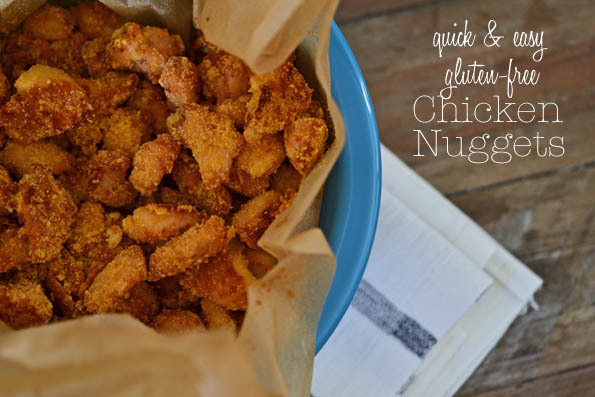 Whenever I make this recipe for gluten-free chicken nuggets, I don’t make enough. Not because there isn’t enough food. Because there isn’t enough of these particular gluten-free chicken nuggets go around. Get it? They’re that good. And I can prep them ahead of time, then just throw the raw, crusted chicken pieces in the refrigerator on a baking sheet. Time for dinner? Turn on the oven, pop ’em in right from the refrig and chicken dinner is served! I may have all I can handle right now with my coffee and my little spoon. I do so love my coffee and my little spoon. And Andy Garcia is like a dream come true, even if he were treating me like a child. I have no need to schedule the playdates. I’ll just drink my coffee, Andy. But even if I’m not scheduling the playdates (which, by the way, I am), and no matter what else I’m doing that day, one thing’s for darn sure. My children are going to insist on eating dinner. And Andy Garcia is nowhere nearby to treat me like a child who can’t make dinner. So I’m gonna have to do it myself. Sometimes I need to be able to prep dinner long ahead of time, and then just throw it in the oven when we come home from my son’s karate (sad fact about karate: they don’t say “haiYA!”). Maybe you need to get dinner on the table fast when you come home from work and the kids are STARving-mom-when’s-dinner-gonna-be-ready. That is most likely why these chicken nuggets are dinner in my house at least once a week. 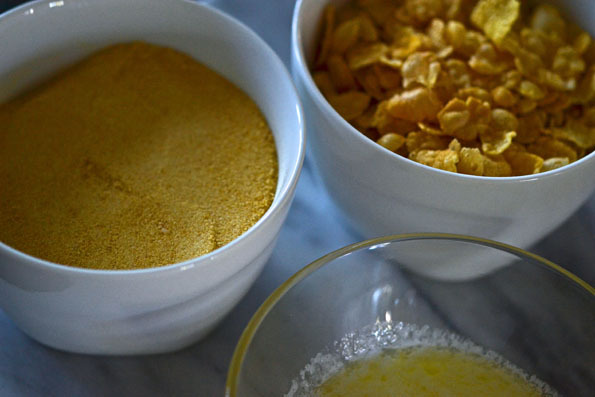 Semi-Pro Tip: Grind up the plain gluten-free cornflakes (I really like Erewhon brand, since it’s just corn and salt, and very flaky) super duper fine. That way, the whole shebang bakes very fast, and the nuggets will actually stay fresh longer if you ever want to bake them ahead of time. When you bake with bits of cereal that are not finely ground, they grow stale very quickly. So grind a few boxes of cereal in a blender or food processor ahead of time, and keep it in a canister at the ready. Always buy some skinless boneless chicken at the market, and you’ll be a few minutes away from a super easy dinner at all times. Preheat your oven to 350°F. Line a half-sheet rimmed baking sheet with unbleached parchment paper and set it aside. 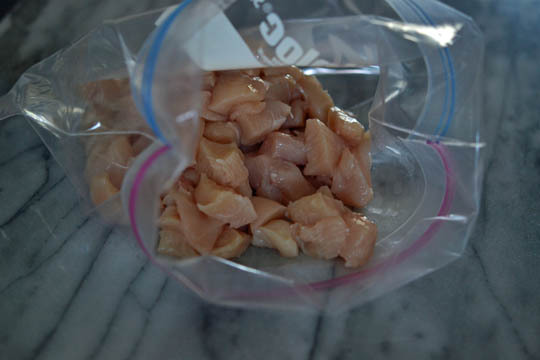 Cut the chicken breasts into cubes about 1 1/2 inches square and place them in a gallon-sized zip-top plastic bag. Add the salt, optional garlic powder and optional thyme leaves to the plastic bag, close the bag, and toss to coat. Open the bag, add the melted butter, zip it closed and toss to coat again. Open the bag once more, add the cornflake crumbs, zip it closed and toss to coat one final time. Unzip the bag and dump all of the contents of the bag onto the prepared baking sheet, and spread the chicken into a single even layer. Place in the center of the preheated oven and bake until the chicken is cooked through and the crust is golden brown, about 12 minutes. Serve immediately. Try adding some finely grated Parmigiano-Reggiano cheese to the chicken with the ground cornflakes for tremendous depth of flavor. Instead of all butter, try 3 tablespoons of melted butter and 2 tablespoons ghee or canola oil. Oooh baby. P.S. If you haven’t yet, please pick up a copy of both of My Cookbooks! I can’t keep the blog going without your support. I love your recipes but have a much healthier option for this….I have done something similiar for years but instead of butter I do the following…..I use lowfat evaporated milk (1/2 c) and put in bowl and add the chicken pieces, let sit for couple minutes and then using my hands I remove the chicken and let the milk drip off but some will stick. Then put the chicken in a bag with the cornflake crumbs and fajita seasoning added. 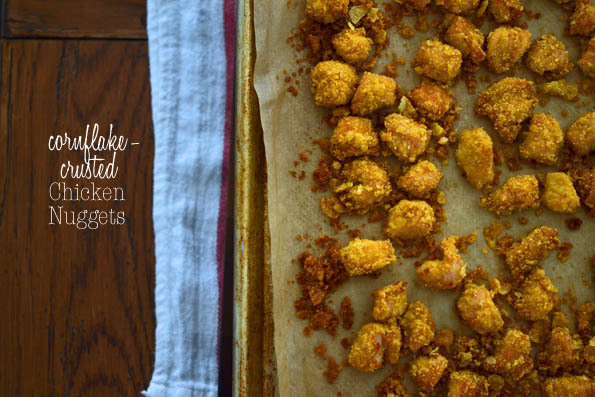 Shake and then place on cookie sheets…the crumbs will stick to the chicken and they will taste wonderful. These were yummy! Thanks so much. GFBoy asked for nuggets for his birthday dinner tonight, so I tried these adding in the parm cheese. A huge hit around here! Nicole, this may sound like a strange request but would you consider putting a little side note on your receipes that call for parchment lined pans as to whether or not you line you USA pans? I never quite know whether to use it or forego it. It’s another sponsor plug opportunity, lol. :-) The chicken nuggets looks amazing! Before going GF I had a recipe using cornflake crumbs and finely ground pecams (milk, no butter to coat the chicken). It’s now a favorite with my DGK’s. Almost can’t make enough to please. I definitely am going to try yours (especially the hint of using a plastic bag – what a time and “mess” sasver). So, sweet miss Nicole…make me a happy girl? Yes? GF Pierogies! Oh, how I miss you!! My wife makes chicken nuggets and chicken fingers using a mix of gluten-free panko and gluten-free chicken coating crumbs. We keep kosher, so don’t use butter, but put the chicken in a beaten egg before putting them into the crumbs. We do bake the chicken nuggets/fingers, much healthier that way. Chicken fingers with GF breadcrumbs were the first thing my girl ate ravenously after her diagnosis (like up to 8 a day!) but I like the cornflake idea even better! Love the semi pro tip :) Thanks for a fast and easy dinner recipe. I’m thrilled to hear the new cookbook has lots more. I certainly could use the inspiration! Quick and easy chicken nuggets! Yum! Love your cookbook! Looking forward to your new cookbook! I’ve had it pre-ordered for MONTHS!!! Thank you. My coffee and my little spoon are about all I can handle at the moment, so just thank you. I may not know how to deal with all of this other stuff, but at least I know what to make for dinner. Is this recipe in the new cookbook? Was already planning to make your chicken finger recipe tonight, so I’ll switch it up to this, instead. I love, easy, yummy stuff! And, I love you, too, Nicole! Oh my goodness – I have been working way too hard on this dish. Dredging chicken in flour, then egg, then bread crumbs and here you go and make it easier than pie! I know I have told you in the past that you are my hero, but now I may just have to post your picture on the fridge with all the rest of my loved ones. I do the work-too-hard version when I’m doing full cutlets for Chicken Parm, too, Rebecca. But for a regular weeknight, in a rush, shake & bake baby! So glad to save you some time, friend. I seriously just took out chicken this morning and said to my self “self, what should you do with the chicken?” now I have a plan. Although this is a “quiet night” with no activities and i feel guilty doing this. Maybe I’ll be proactive and just make them ahead of time for tomorrow! Oh wow, how on the ball, I’d seem then! I know these are good! I have a recipe that is similar to it. It has Worcestershire sauce in the butter. Melt 3T butter and add 2t worc. sauce. Then you coat the chicken in a combination of 1 c crumbs and 1/4 grated parm cheese. Soo yummy! (I guess I should say that I got the recipe from my Incredible Edible Gluten-free Food for Kids cookbook! by Sheri Sanderson). OMG OMG OMG! Thank you so much for posting a non-baked good recipe!! I’ve been struggling finding these types of recipes and use your 1st cookbook a lot! You’re the best EVER!! !